BOCA RATON, FL--(Marketwire - December 16, 2008) - Breaking ground this month, this oceanfront custom residence on Chub Cay will ultimately cast an eco-iconic profile against the sky, armed with the latest renewable energy technologies. 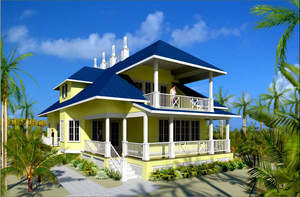 Designed by Affiniti Architects of Boca Raton, Fl in cooperation with Bahamian builder MaycoRDR Construction, the house embodies the type of sustainable green design principles that eco-conscious homeowners are looking for, addressing the needs of Bahamians to decrease their dependence on oil. Demonstrating that a "green home" does not have to be a stark modern design, this 3000 SF home has an array of four vertical Tangarie Alternative Power wind turbines (and another 3 KW of flexible solar panels), generating electricity silently even with gusts as small as 4 mph. heating more efficiently than electric water heaters. For hurricane-proofing, a Gaia Power Tower, including two battery backups, guarantees power through power outages. Further, the metal roof is designed to withstand 160 mph winds and the double-impact German-made windows and doors are rated to 187 mph. "We saw this as an opportunity to show that low impact living is not only achievable, but can be accomplished without sacrificing the design style of the island," said Ron Rickert, AIA, Partner and Caribbean Director for Affiniti Architects. Specializing in luxury resort, communities and multi and single-family residences, Affiniti Architects has completed several projects in Florida, North Carolina, the Caribbean, Costa Rica and more recently, Dubai. The company has earned more than 350 design awards for residential architecture, including two LEED Gold homes in Florida. For more information, visit www.affinitiarchitects.com.